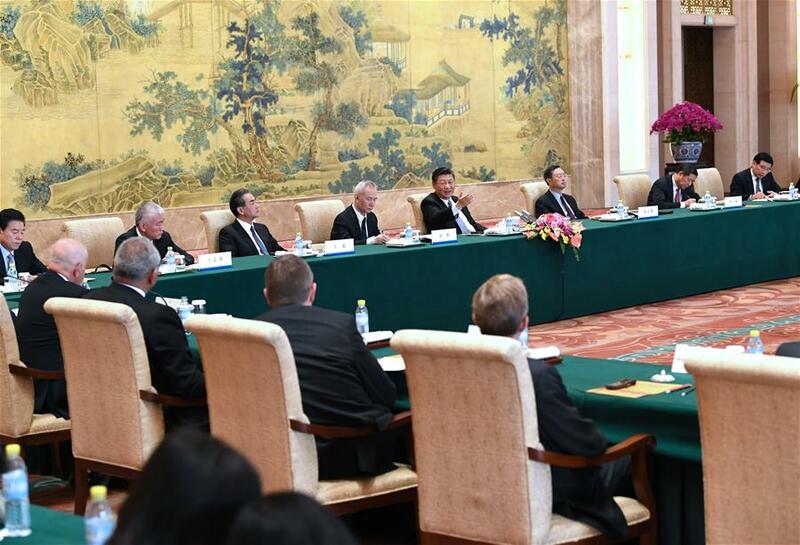 BEIJING, June 21 (Xinhua) -- Chinese President Xi Jinping Thursday met with executives of a number of famous multinational companies, who are in Beijing to attend a special session of the round-table summit of the Global CEO Council. 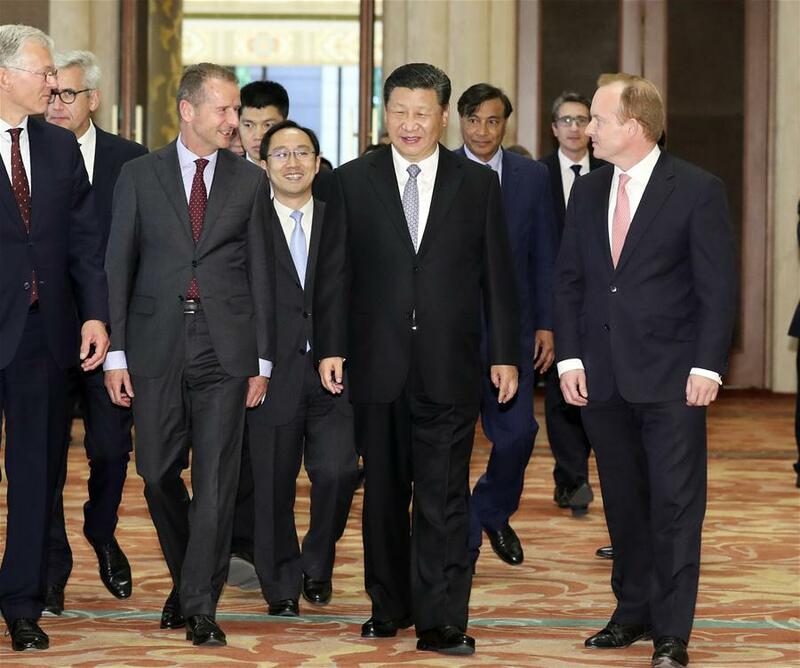 Focusing on the summit's theme of opening up, cooperation and mutual benefit, Xi and the executives exchanged views on topics ranging from the Belt and Road Initiative, innovation and smart manufacturing, to green development and global governance. Xi said the companies had participated in, witnessed, contributed to and benefited from the reform and opening-up drive of China over the past four decades, during which the country sustained rapid economic growth and helped more than 700 million of its people shake off poverty, according to UN standards. Looking forward to the future, China had more confidence in reform and opening up, and more belief that opening up can be a key move for China's development, he said. Since 2017, the global economy had seen steady and positive development. However, Xi said world economic growth was still weak, as trade protectionism, isolationism and populism continued to rise, and the challenges to world peace and development were getting more severe. "In the new situation, opening up should never stop and quality of the opening up should be pursued," Xi said. "People should carry out cooperation to help each other and face challenges together, while pursuing a win-win situation. "The international community is a global village and should not engage in zero-sum games. The future of the world should be decided by all countries, with international rules written by all, global affairs jointly governed by all, and development progress shared by all. China is willing to work with other countries to build a community with a shared future for humanity," said the Chinese president. He pointed out that the Belt and Road Initiative, which has greatly tapped potentials and benefited the people since it was launched five years ago, is not exclusive, but open and inclusive. 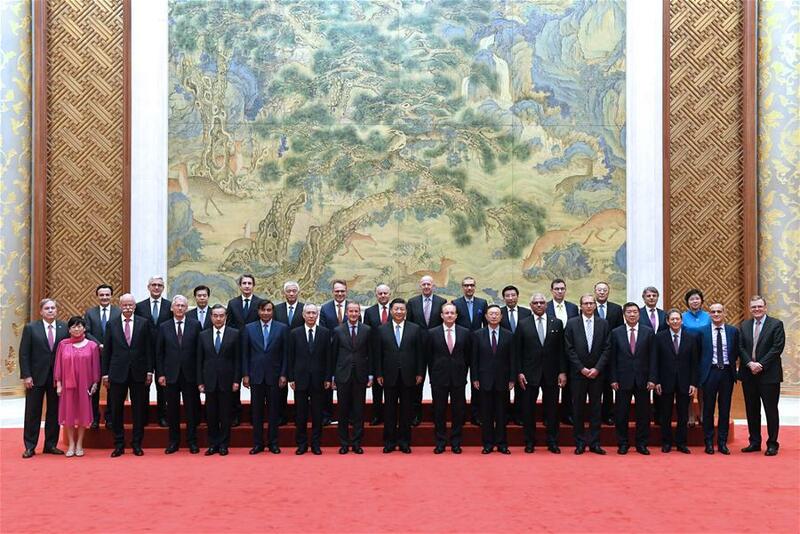 "It is not a solo performance of China but a chorus of countries along the route," he said. "We encourage multinational companies to cooperate with Chinese companies to achieve mutual benefits and realize more substantial results." He emphasized that as innovation and development had become more popular, and innovation-driven development strategies advanced, the pace of China's technological innovation had become more steady. "We always regard meeting the people's aspirations for a better life as the starting point and final objective of technological innovation," he said. On green development, Xi said the modernization China is building is the one of harmonious coexistence between human and nature. He stressed that China would impose the strictest rules and laws to protect the eco-environment in order to leave a sustainable environment to future generations. Xi said that economic globalization had made important contributions to world economic development, and had become an irreversible trend. "China will follow the principle of achieving shared growth through discussion and collaboration in engaging in global governance, continue to play a responsible role as a major country, actively participate in the reform and construction of global governance systems, and inject impetus into the reform and optimization of global governance," he said. Xi called on the international community to "take the road of reform, opening up, innovation and development, and not to go backward to isolation, inflexibility, protectionism and unilateralism." He stressed that foreign capital had played an active and important role in China's economic development and the process of deepening reform. "Over the past 40 years, China's economic development has been achieved thanks to opening up. In the future, China's high-quality economic development must be pursued with even greater opening up," he said. "China's door to the outside world will open even wider, rather than being closed," he said. "China will continue to greatly ease market access, create a more favorable environment for investors, strengthen the protection of intellectual property rights and expand imports to create a more relaxed and orderly environment for domestic and foreign entrepreneurs to invest and start businesses in China." The entrepreneurs attending the meeting spoke highly of China's reform and opening-up achievements, and said they appreciated China's contribution to world economic growth. They stressed that multinational corporations were pleased to be part of the reform process of China over the past 40 years, as they had benefited from the long-term growth of China while making their own contribution to China's development. They said the rest of the world should increase their understanding of the Chinese culture and the governing of the Communist Party of China. They said they appreciated China's firm support for globalization and its opposition to trade protectionism, as economic globalization was an irreversible trend. The executives agreed that multinational corporations enjoy a constantly expanding space for development in China. They said China had demonstrated its leading role in building a community with a shared future for humanity with contributions such as pushing to reach the Paris agreement on climate change. They said transnational companies were willing to participate in the Belt and Road Initiative and expand exchange and cooperation with China in many areas to achieve greater development and grow with the Chinese economy.